Goodwin Technology Has been developing digital readout since 1977 we have every type of scale and console to support our own equipment and almost every other manufacturer. 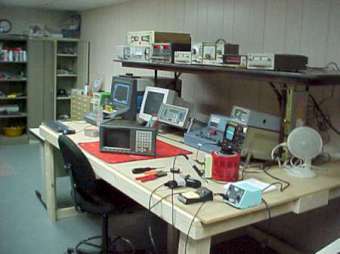 We have large repair bays to support all types of digital readout console and linear scale. We are used as the main repair centre for most of the UK's DRO service engineers. We support our product right back to the start so you can send in a 30 year old piece of equipment and it will be repaired within around 3-4 days depending on the work required. So we supply new equipment - support your old equipment - or can retro fit in a some new kit to fit in with what you currently have to save time and money. We have very large stocks of news linear scales and consoles that we generally ship out same day to ensure you get back in production as soon as possible. We have every option available for shipping. Small parcels: We generally use UPS or DHL for the best prices, and to ensure your purchase gets to it's destination quickly and safely. Larger palletize items: We generally use a pallet delivery company for speed and to keep the cost down prices are available upon request and differ from item to item. Large items, Heavier than 1 ton in weight: We have specialist delivery companies ready to deliver your machine to your door with Hiab vehicles and if needed scate them into position just call for a quote. We accept prompt order cancellations by phone or email. if specialist parts have been fitted or ordered then there may be a charge. We want you to be totally satisfied with every purchase you make from Goodwin Technology. It is our aim to offer you value and quality at outstandingly low prices. If, for any reason, you are not completely happy with your purchase, simply return it to us within 7 days of delivery, unused in its original packaging, together with the receipt. We will exchange it or offer you a full refund and that is guaranteed! The 7 day money back guarantee is in addition to our obligations with respect to your statutory rights, which of course remain unaffected. For large items such as machines please call and discuss terms of sale and options available. Via Phone +44 (0) 151 608 8666 from 8:00am till 5:30pm. Goodwin Technology Ltd, 4 Vale Row Park Vale Ave, North Cheshire Trading Estate, Prenton, Wirral, CH43 3HE, England.